Former West Ham boss Slaven Bilic has rejected the chance to speak to West Brom about their vacant manager's position. 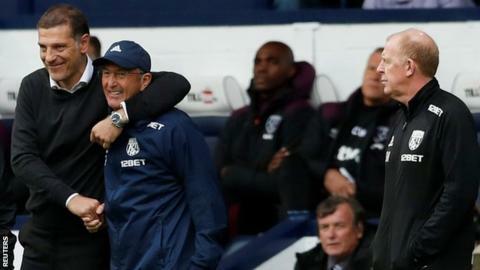 Bilic was sacked by the Hammers on 6 November and Premier League rivals West Brom dismissed Tony Pulis on Monday. It is understood the 49-year-old Croat wants to take a break from the game. Gary Megson is in temporary charge at The Hawthorns, with ex-Crystal Palace and Newcastle boss Alan Pardew odds-on favourite to get the permanent job. Megson, who spent four and a half years in charge of the Baggies from March 2000, is set to take charge of Saturday's league game against Tottenham at Wembley. His last managerial role was at Sheffield Wednesday, who sacked him in February 2012. Does sacking a manager this early work? Megson's first big decision this week was to tell fellow assistant head coach Ben Garner to stay away from the club. He said: "It wasn't a decision negatively with him, it was a positive decision about what I think needs to happen at the football club. "I won't do a character assassination of someone. But I know how I want the club to run and it was what I wanted to do. "On the back of Tony leaving, I needed to lift the mood." Megson has spoken "numerous times" to Pulis since the Welshman's departure from the club. He does not think not think it will be long before the former Stoke and Crystal Palace manager is back in the game - and said the 59-year-old's wife Debs is already complaining about him getting under her feet. He said: "He has taken 1,000 games and has seen all sorts of different things. Nothing fazes him. "He has this record of never being relegated as you come up to the second half of the season. He might be someone who is quite sought after at a club that is in a little bit of trouble." Megson will be involved in a game at Wembley for the first time since April 1988, when he was a player at Sheffield Wednesday. Wednesday were runners-up to Nottingham Forest in the Mercantile Credit Football Festival, a two-day event involving 16 teams held to mark the 100th anniversary of the Football League. He said: "Howard Wilkinson was the manager at the time. He told us it was serious but it wasn't. It was a Mickey Mouse thing, a tournament they gave a go in order to see if it worked. It didn't. "Getting to Wembley is being an international player or reaching a cup final. I played in three semi-finals and lost the lot. This is a league game that happens to be at Wembley. It isn't the same."